Hand-brushed matte golden leaves plated in genuine 14K Gold and meticulous craftsmanship define this exquisite hand-wired bridal comb. With lustrous freshwater pearls and dazzling pear-shaped crystals, you'll shine with designer elegance in this stunning and top-selling Mariell wedding headpiece. Worn off to the side or tucked into an up-do, this glistening bridal hair comb with hand-enameled gold foliage is a work-of-art. All eyes will be on you as you make your grand entrance flaunting this breathtaking for floral hair adornment. This wedding hair comb is perfect whether worn to a formal country club reception or an exotic destination wedding. After the big day, this hair comb is perfect for your honeymoon, a moonlight walk on the beach or a romantic candlelight dinner. 4" w x 2 1/2" h. When you purchase this genuine "Mariell Designs" brand headpiece, you'll enjoy our internationally recognized couture name and our exclusive 100% Risk-Free Purchase and Lifetime Guarantee. Treat yourself or someone you love to some seriously gorgeous sparkle with high-end designer styling at a price that will have you celebrating. 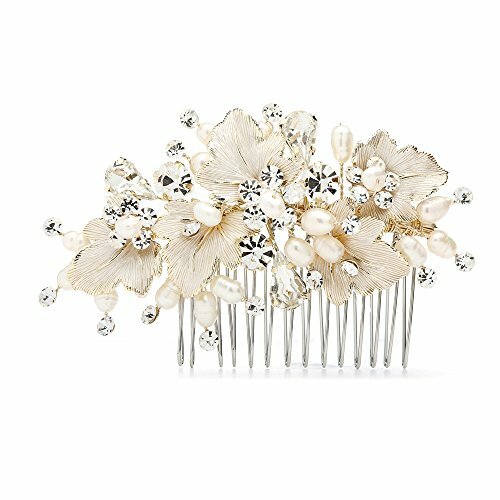 We promise you'll adore this best-selling hair comb for your special day or your money-back.